Master of Business Administration students from Indiana State University and Fundação Getulio Vargas in Brazil learned the unexpected twists and turns companies can encounter in their quest to go global. 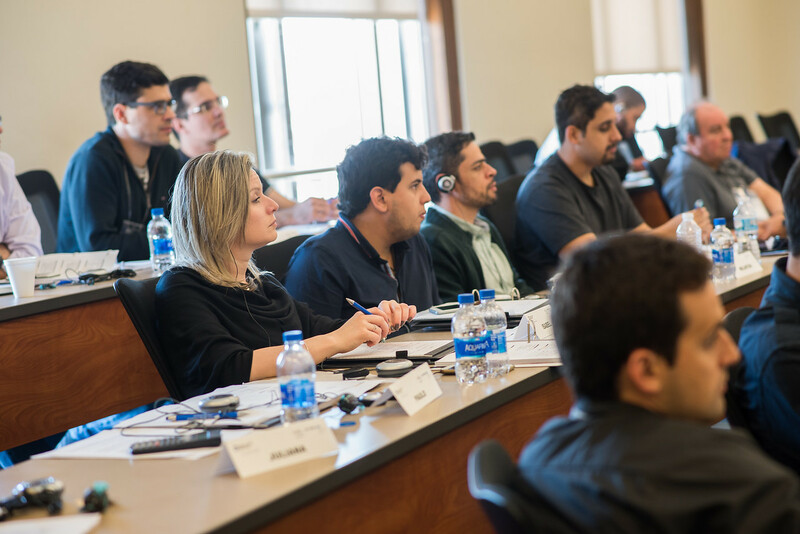 It was a lesson for nearly two dozen students and faculty from Fundação Getulio Vargas who took part in Aruna Chandra's Finance for Executives program at Indiana State's Scott College of Business, May 20-28. The weeklong program included a variety of modules, lectures and hands-on activities in the areas of finance, entrepreneurship, teaming and motorsports, as well as a discussion on Uber's international strategy. The May 25 discussion and brainstorming session included State's MBA students who participated in Chandra's faculty-led trip to Brazil this spring. It was a first time meet-up between students from the two universities since Chandra assumed coordination of the program following the death of finance professor Eurico Ferreira in 2014. "Sometimes we live in bubble and it's hard to remember that every place doesn't operate just like the U.S., but getting to share perspectives with people from other countries helps take us out of those bubbles," said Indiana State MBA student John DeLisle, who participated in Chandra's faculty-led trip this spring. "Brazil and the U.S. are different business environments in many ways, so being able to share our experiences and perspectives gives us a new way to see the world," said Marcondes Moraes, a student in the MBA program at Fundação Getulio Vargas. It was a valuable lesson, Chandra said, because every business tries to get into other markets and even large corporations can face insurmountable barriers in the form of regulations and local competition. "I want (the students) to understand that formulating and implementing strategies in a global context is very complex. It's not straightforward because each market has its own twists, turns and quirks," said Chandra, a professor of management at State. "You would think that Uber or Amazon would be able to go in and quash local competition, but it's not always the case. How do they do it? What are their approaches and why can't they succeed in global markets sometimes, in spite of all of their resources and capabilities?" Although the heart of the program was about exposing Brazilian students to perspectives on topics related to finance for managers, the delegation spent the first two days of the trip at the Chicago Board of Trade and the Federal Reserve, followed by three days at Indiana State and a session on motorsports before heading to the Indianapolis 500 on Sunday. "This is the first time these students have had an experience like this and being able to learn from Indiana State's students and share perspectives to business issues and get a grasp of what life is like in the Midwest is a very rich experience for these students," said Pedro Carvalho de Mello, a professor from Fundação Getulio Vargas who accompanied the Brazilian students to Terre Haute. "It's an interaction of ideas and allows the students to get an idea for how students from other parts of the world think and analyze problems in a business environment, which is valuable in the workplace." Because the Brazilian students were full-time, mid-level executives from a variety of industries seeking exposure to an American viewpoint on business issues, Chandra also arranged for them to attend seminars with Indiana State professors, including mergers and acquisitions with Reza Houston, assistant professor of finance, forensic accounting with Matt Cohen, instructor of accounting, and macroeconomics of the U.S. with Bob Guell, professor of economics. Nearly two dozen students and faculty from Fundação Getulio Vargas took part in Aruna Chandra's Finance for Executives program at Indiana State's Scott College of Business, May 20-28.